I was scrolling through my saved collection from instagram and came across this little amazing sketchnote from @mrsgeekchic . I love how approachable all of these items are, and easy to get your hands on. I think so often we forget to let students create and play and show their knowledge in other ways. Take a look at this set up, I pulled this from the @doinkapps on instagram they got it from a teacher named Judy Bowling. 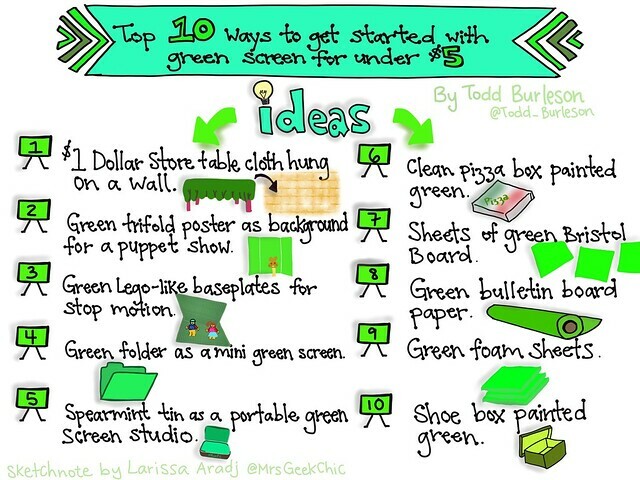 Love seeing the green folder idea above in action. I love doing green screen work with students, although I have mostly done this with elementary. Would be fun to work with some secondary students with a green screen.